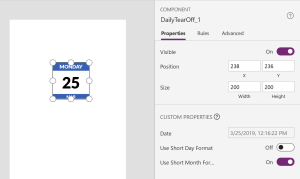 For this example, I’m going to create a control to display today’s date, visualized as one of those daily tear-off calendars you might have seen at some point on someone’s desk. Since the component will be reusable on multiple screens, I’ll add properties to the control to set the data and visual configurations. 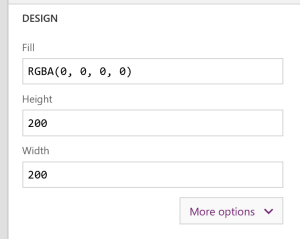 I’ll also show how to use relative sizing to scale the controls when the component is resized, and how to scale font sizes as well. For this post, I’ll create a new blank Canvas app, using the Phone layout. I’ll name the app CalendarComponent (from File > App Settings), and then Save it (always name and Save your app right away to avoid losing work if your browser closes). 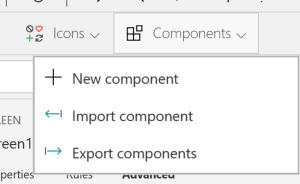 From the Components menu, I’ll select New Component. I will rename it to DailyTearOff. Next, I’ll add some controls to the canvas. A rectangle, 200×45, placed at the top. A label on top of this also 200×45, with font size 21 and Align.Center, Color.White, and Font of Lato Black. 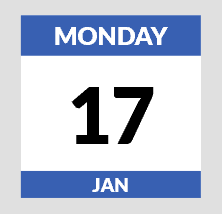 A label for the date number, 200×120, font size 64, Align.Center, and font of Lato Black. Place this directly underneath the previous two controls. Finally another label and rectangle at the bottom, similar to the top, 200×35, font size 16, Align.Center, Color.White, and Font Lato Black. 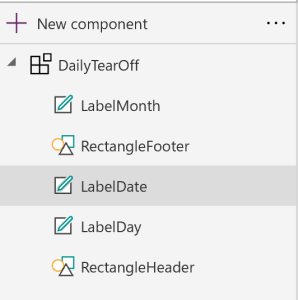 If I click the component in the tree view, and look at it’s properties, I will now see Date. Also notice that it is set to a default value of Now(). 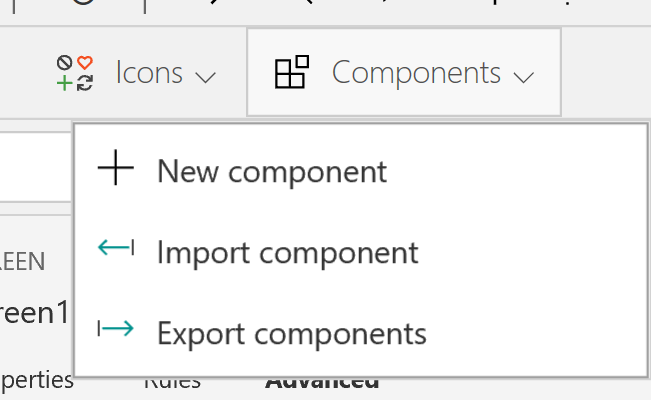 I could change that default if I want, and it will also get overridden with whatever the user of the component sets as the value. 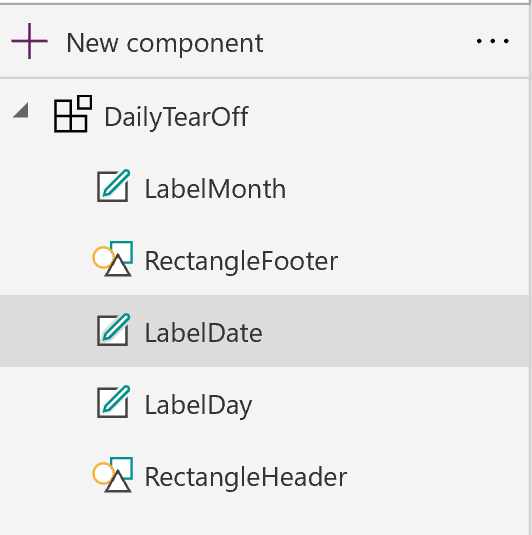 Next, I’ll add some properties to control the display of the date info. For example, Month display could use long month, or short month format. Same with the weekday. 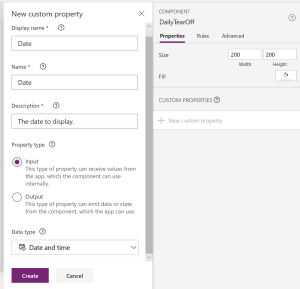 I could also control casing of the month and day values if I wanted to with additional properties (I’ll leave those as another exercise for the reader). In this case, Parent is the Component itself, so we can reference it that way. Now that I’ve got it wired up, I’ll test it out. I’ll switch to one of my screens, and place the component on the screen. It looks nice! In order to get this to resize well, I’ll have to use relative positioning, adjusting the width/height as well as X/Y positions of the elements, relative to the parent component size. There are lots of ways to do this depending on your requirements, and how I approach this below is just one way of doing this. For my approach, I’m not going to be concerned about growth in Width so much, but rather when the height changes, I want to adjust the elements inside and scale them. So for all of the controls inside, I’ll change all their Widths to match the component’s, using Parent.Width. To speed this up, I’ll use Ctrl + A to select all the controls on the component canvas, pull down the Width property from the formula bar, and put in Parent.Width. 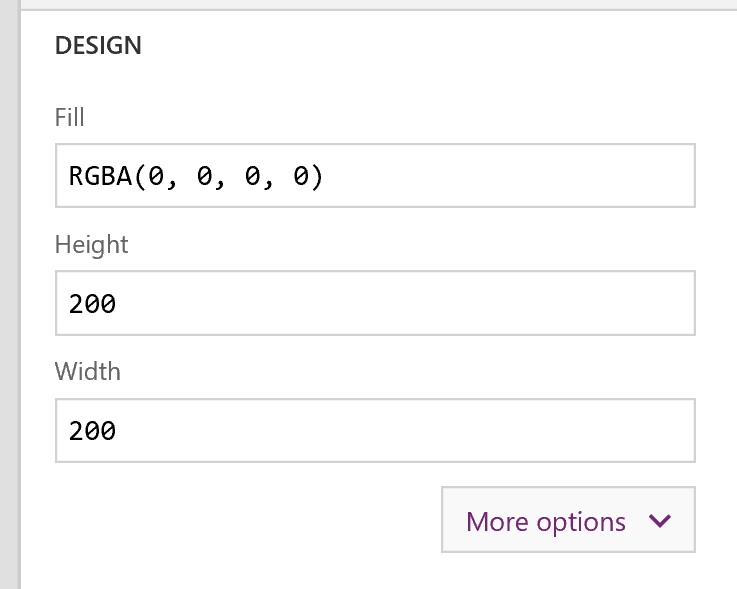 For the height, I’ll need to know the ratio of the items in their original default sizes (200×45, 200×120, 200×35). Then I’ll adjust the height of each control to be the height of the parent multiplied by this original ratio (CurrentParentHeight * OriginalControlHeight/OriginalControlWidth). I’ll go through and do this same thing for each of the controls on the screen. At this point, it works much better, with the exception of font-scaling. Hopefully I’ve showed you in this post how to create a component, along with some approaches for resizing the controls inside.